Once viewed with disdain as a post-­war architectural quick fix, prefab is fast becoming the way of the future, creating new spaces with an incredible turnaround time and sound economic savings without sacrificing quality. Hayball, one of Australia’s foremost architecture, urban planning and interior design practices, is a leading light in the new prefabrication movement. We chat to director David Tweedie, with years of architectural experience in both Australia and the UK, and get his insider’s expertise. What role is prefabrication playing in transforming our built environment? Prefabrication is one powerful approach to address the issue of escalating construction costs without compromising quality and incorporating new technologies. Labour cost rates in highly developed economies such as ours challenge the affordability of traditional, trade-based construction. Availability of highly skilled labour is scarce and expensive. Once you combine that with industrial risks and the weather impacts of on-site work, you begin to realise the potential exists to divert skills from the declining manufacturing sector towards off-site construction. How is prefabrication influencing Hayball’s approach to design/construction? Hayball has increased our up front investment in thinking and research, moving towards a component-based approach to design. Rather than relying on late involvement of trades, we’re working in more collaborative procurement models with constructors to bring forward the development of resolved solutions. The globalisation of construction supplies incentivises the use of high-quality components to assemble buildings. When did Hayball begin experimenting with prefabrication? We’ve been experimenting with component-based design over the last ten years, but in terms of wholesale prefabricated elements, it’s been about four years. How have prefab buildings evolved over the past 10 years? We’ve seen the rise of 3D documentation, computer-controlled robotics and routers, and advances in material technologies, logistics and craneage have enabled advances. As an architect, what do you see as the benefits of using prefabrication? The potential for decreasing on-site construction time frames by increasing investment of time and effort prior to the start of construction allows for lower costs overall. Then you have greater predictability in time and cost, and minimised construction waste. You also start to see increasing quality and predictability of outcome, minimising on-site risk. The elements are built in a controlled, safe and comfortable environment, with less on-site wet trades, weather risks, scaffolding, and with less exposure to materials like solvents Some things aren’t possible to build on site- for example the incorporation of sophisticated materials might require assembly in a controlled environment. Suppliers can provide holistic, complete, quality controlled solutions. Prefab allows for use of robotic welding techniques enabling new design solutions. What are the challenges of working with prefab? Prefab requires significantly greater up-front investment in thinking and research, and the development of appropriate partnering models that allow this to happen. The desing team needs to be completely integrated and working in a highly consistent way. Client support is crucial – their willingness to work in a partnering model and share up front risk will unlock the potential to innovate. Financing and bank approvals for off-site construction can be a challenge too. Where do you see the biggest area of growth for this industry? We’ll see it come into play with mid-rise, multi-residential housing, due to smaller construction spans and the incorporation of complex elements with high-risk of quality control issues. You’ll also see it in remote projects or any building type on a difficult site in terms of access or founding condition. It’s also handy for education projects, which might require transportability. Can you provide an example of a recent project in which you have worked with prefab? 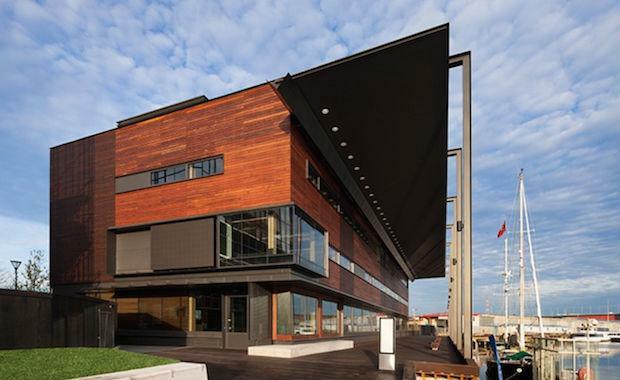 With Clare Design, Hayball worked on the Library at the Dock in Docklands. It’s a newly completed library for the City of Melbourne, built by Lend Lease, which uses a prefabricated timber structure Hayball is now currently working on major residential projects using the technology.